Is your garden in need of some attention? Grass getting too thick? Sunraysia Mower Centre has the solution for you. 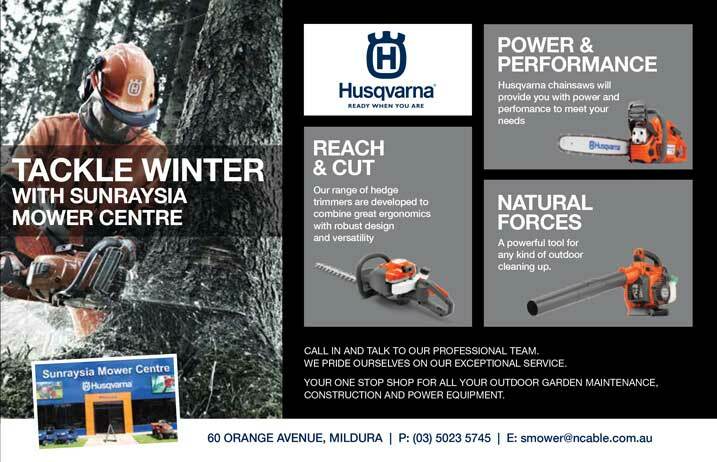 We offer the widest range of outdoor power equipment and garden products in Mildura and surrounding areas so that you can manage your garden and allow it to live up to its full potential. With 30 years of experience in the industry our experts can perform repair and maintenance services to ensure that you are getting the most out of your equipment. We are your all-round specialists for lawn mowers in Mildura, so call us today to find out how we can help you. We have been serving the community of Mildura for over 30 years, and have built a solid reputation for providing expert advice and products, at an affordable price. In addition to supplying quality new lawn mowers and advising customers on the best products for their lawn or garden, our fast and reliable services will keep your garden beautiful for a long time. Selecting the right products for your garden can be difficult but it doesn't have to be. Our specialists in Mildura have the expertise to help you choose the products you need to be on your way. All members of our staff are fully qualified and trained to provide you with expert advice. From consultation to ongoing maintenance support, we're here to lend a helping hand, or green thumb, when you need it. At Sunraysia Mower Centre in Mildura we believe that everyone deserves the chance to have the garden of their dreams. Offering reliable and efficient power equipment isn't enough for our staff. We are also dedicated to providing the most affordable garden solutions in the area, getting your garden into shape without breaking the bank.